A weekend seminar based on the famous month-long Kopan meditation courses. 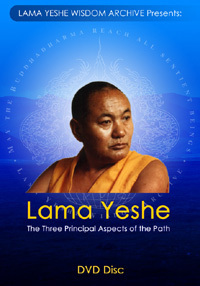 Preceded by Lama Yeshe’s lecture on meditation, these teachings encompass the entire Buddhist path to enlightenment. The teachings on this DVD set can be found in the book also titled Freedom Through Understanding. A weekend seminar on death, intermediate state and rebirth taught by Lama Yeshe in Geneva, Switzerland, in September 1983. The topic is particularly poignant as this was the last teaching Lama gave in the West; he passed away some five months later. Here he was his usual boisterous, punchy, direct, funny, loving and compassionate self, treating death in his incomparable light yet serious way. In October 1982, after the visit of His Holiness the Dalai Lama to Istituto Lama Tzong Khapa, Italy, Lama Yeshe was interviewed on behalf of the Meridian Trust, the Buddhist film and video archive. These interviews offer a fascinating insight into one of the greatest Tibetan masters to come out of Tibet and one of the most effective in bringing the teachings of the Buddha to the world at large. 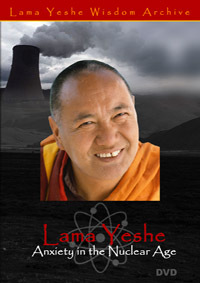 In two public lectures in California in July 1983, Lama Yeshe addressed the perils of the First Nuclear Age, exacerbated at that time by the Cold War and Americans' worries over the Soviet nuclear threat. Although the nature of our current concerns is different, Lama's observations and insights are as relevant today as they were when he first made them and we are honored to bring them to you on this DVD. 2-Disc Set, over 7 hours total! 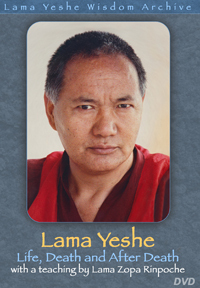 In the three teachings presented here, recorded at Vajrapani Institute, California, in July and August, 1983—a mere eight months before he passed away—Lama Yeshe explains what the Heruka Vajrasattva tsok offering is and how to do it. DVD with two short videos. 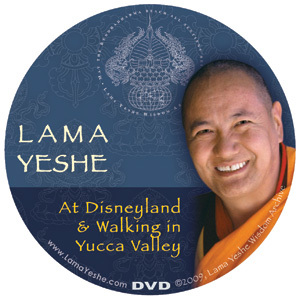 At Disneyland: footage of Lama Yeshe visiting Disneyland with students, and Walking in Yucca Valley: Lama Yeshe walking and talking with students. A special question-and-answer session recorded later accompanies the footage, which was filmed originally without sound. 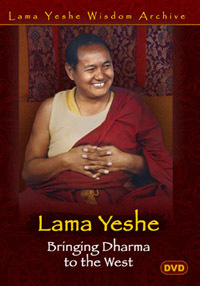 During His Holiness the Dalai Lama's 1982 teachings at Institut Vajra Yogini, France, Lama Yeshe was asked to "baby-sit" the audience for a couple of days when His Holiness manifested illness. The result is this excellent two-part introduction to the path to enlightenment, in which Lama explains renunciation, bodhicitta and the right view of emptiness. We're sorry, this item is out of stock. 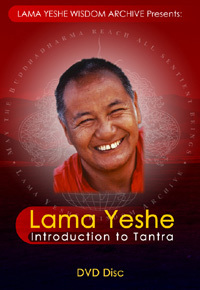 In 1980, in California, Lama Yeshe gave a teaching on the fundamentals of tantric practice. Click for links to watch on YouTube.